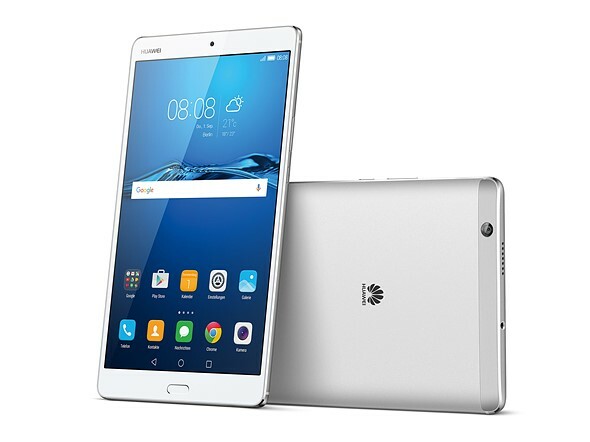 With the MediaPad M3, Huawei has launched an interesting new option for photographers who like showing images or videos to clients or friends on a tablet. An 8.4″ IPS display with a resolution of 2560 x 1600 pixels displays sharp images and an ‘eye-care’ mode filters blue light to put less strain on your eyes while viewing the screen. Sound is played back through stereo speakers that are powered by an AKM soundchip and Harman Kardon engineered surround sound technology. The Android operating system is powered by Huawei’s own Kirin 950 octa-core chipset and 4GB of RAM. Buyers can choose from 32 or 64GB storage versions and there is also a microSD expansion slot. Huawei claims the 5100 mAh battery is good for 11 hours of video playback and the fingerprint sensor at the front doubles as a navigation tool. Tap and swipe gestures let you use it as a back or home button and for scrolling. The Media Pad M3 is not meant to be a capture device but, just in case, 8MP cameras are available at front and back. All the components are wrapped up in a sleek-looking and only 7.1mm thin metal unibody. The device will be available in Europe, starting at €349 (approximately $390) for the 32GB version. No information on pricing in other regions has been provided yet.